Learn About Martin Luther King, Jr.
Martin Luther King, Jr. is an iconic figure in many ways. In America, he even has a national holiday! You might be learning about him as part of this holiday or for Black History Month. Or you might be studying the Civil Rights Movement. Whatever the reason, this unit study from Life of a Homeschool Mom is a great way to learn about his life and achievements! This unit study is great for upper elementary, middle school, and junior high students. It also encourages kids to think about ways that they can make a difference in their own community. To get your free unit study, just go to Life of a Homeschool Mom. While you’re there, be sure to check out the other great ideas and resources! 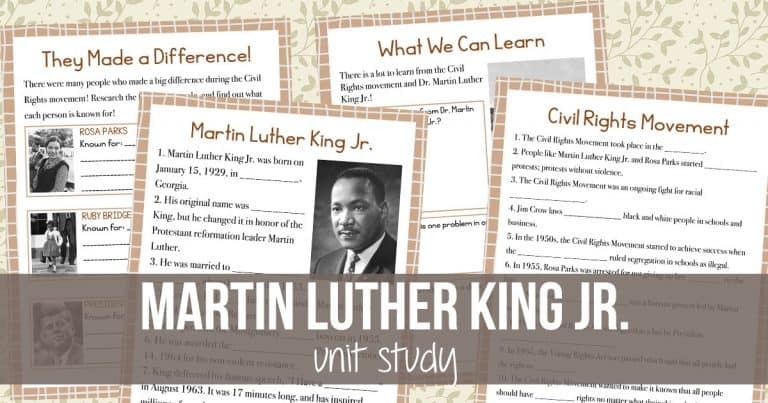 Download your free Martin Luther King, Jr. Unit Study!